The Sheffield Chorale was formed in 1974 as the BBC Radio Sheffield Choir before settling on its present name several years later. We are proud that several of its founder members are still with the choir today. This numbers around 55 with our singers coming from all walks of life. The choir's repertoire is wide and diverse, ranging from the Renaissance period right through to 21st century pieces. Recent performances include Orff, Carmina Burana; Brahms, German Requiem; Purcell, Dido and Aeneas; Rachmaninov, Vespers; and a full concert of works by Benjamin Britten. 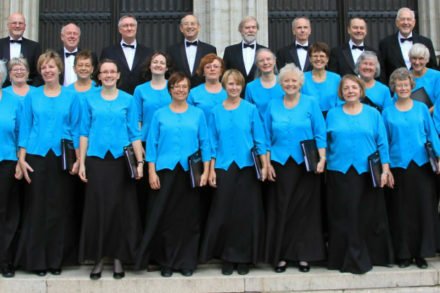 The choir has sung at the Buxton Fringe Festival and in October 2013 in Brussels and Ghent cathedrals. Rehearsals are held every Monday evening with admission to the choir after successful audition with our professional Musical Director, Neil Taylor, formerly Organist and Master of the Music at Sheffield Cathedral. The choir performs three concerts each season, plus a service of Nine Lessons and Carols every Christmas.